Monday, 3 December 2018, 11:28a.m. A warm, wet and humid air mass has descended from the sub-tropics bringing another round of unsettled weather. Thunderstorms across the country could bring as much as 40mm of rain an hour, hailstones over 20mm in size and a risk of slips and flooding. There was a moderate risk of thunderstorms from the south of Northland to Wairarapa, including Auckland, this afternoon and evening. These thunderstorms could produce downfalls of 25mm/h and hail up to 20mm in diameter. A watch was also in place for Nelson Lakes and south through the central South Island to inland Otago, Clutha and the east of Southland, where downpours of 40mm/h and hail possibly larger than 20mm were forecast. Auckland would see a high of 22C on Monday, alongside potential thunderstorms, heavy rain and even hail. Similar conditions were forecast about much of the upper North Island. A heavy rain watch was in place for parts of South Auckland and Waikato from 6am to 6pm today. 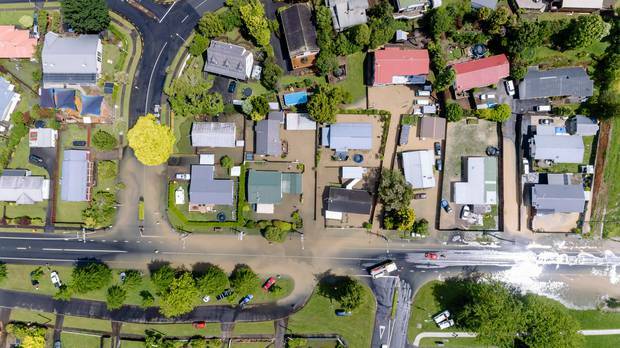 The heavy rain could bring more grief to the dozens of Hamilton residents who had to be evacuated from 10 homes after flash flooding on Sunday. Five homes were been deemed uninhabitable. Troughs would continue to cross the upper North Island in the afternoon and early evening, with a moderate risk of thunderstorms from the southern half of Northland to Waikato and across to Bay of Plenty. There was also bring a moderate risk of thunderstorms from Wanganui to Taihape and Wairarapa. There was also a low risk of thunderstorms over remaining parts of the North Island. Inland parts of the South Island about Buller and the Nelson lakes, and Canterbury high country and eastern Otago and Southland, could also see thunderstorms, bringing hail and heavy rain, this afternoon and early evening. MetService meteorologist Hannah Moes said along with the unsettled weather it was looking to be another "very warm" day. Parts of Wellington are set to crack 27C and even Invercargill could hit 26C. With the weather coming down from the sub-tropics, parts of the country with ranges to the north and west would see high temperatures due to the foehn effect. Tomorrow a front would cross the South Island, followed by a low, bringing rain to western parts of the South Island. Cooler south to southwest winds would move in behind, spreading showers up the eastern side of the South Island, bringing periods of heavy rain from Southland to central Canterbury later on Tuesday and Wednesday. Northwest winds could reach gale level over parts of Canterbury and Marlborough on Tuesday and Wednesday, and over Wellington and Wairarapa on Wednesday. On Thursday and Friday, a ridge of high pressure was forecast to bring more settled weather to New Zealand. Meanwhile, in the Coral Sea 990km northeast of Cairns, Cyclone Owen has formed. While there was uncertainty on the intensity and track of the system, which could become a category 2 cyclone, it was not expected to affect New Zealand. MetService said the most likely scenario was for it to be slow-moving until Wednesday, when it could track towards the southeast in the direction of Vanuatu. Showers, mainly from afternoon, some possibly heavy and thundery with hail. Northwesterlies. 23C high, 16C overnight. ​ Rain turning to showers morning as northeast turns northwest. Possible heavy and thundery falls with hail, easing at night. 22C high, 16C overnight. Morning rain then showers, possibly thundery with hail, easing at night. Northeast turning northwest midday. 22C high, 14C overnight. Showers, possibly thundery with hail, less frequent from afternoon, then easing night. Northeast turns northwest midday. 21C high, 16C overnight. New Plymouth Mostly cloudy. Showers, mainly from afternoon, and northeast turning northwest. 20C high, 15C overnight. Napier Cloudy periods, and a few showers from afternoon. Northeasterlies turning northwest evening. 24C high, 17C overnight. Whanganui​ Fine until afternoon, then showers, possibly heavy and thundery with hail, easing at night. Light winds. 25C high, 15C overnight. Wellington Fine spells and a shower or two, then cloud increasing evening and northerlies developing. 24C high, 16C overnight. Nelson Cloudy periods. Chance light rain. Northeasterlies. 21C high, 16C overnight. Christchurch Morning and evening low cloud, otherwise fine. Northeasterlies. 20C high, 12C overnight. Dunedin Cloudy morning and evening, but afternoon fine spells. Northeasterlies. 19C high, 13C overnight. Heavy rain was forecast about Fiordland and Westland on Tuesday, continuing into Wednesday in central and northern Westland.